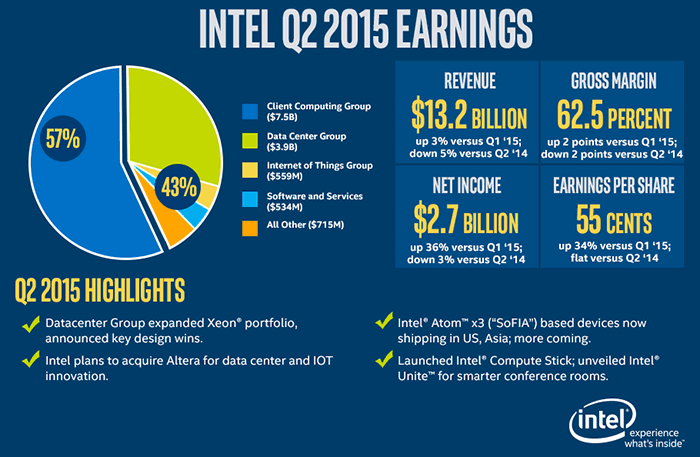 Intel has just released its second quarter of 2015 financials. Results were a little better than expected, more or less in line with the company outlook. Key figures include a reported overall revenue of $13.2 billion, consistent with outlook, and a gross margin of 62.5 per cent, slightly better than outlook. Looking ahead Intel touted "exciting new PC experiences," courtesy of its Skylake PC processors arriving in the second half of 2015. During the most recent quarter some of Intel's businesses groups reported positive trends while others reported negative trends – this provided Intel with a rather flat overall financial results report. On the upswing are both the Data Center Group and Internet of Things Group. They both reported sequential and year-on-year gains. The Data Center Group did particularly well with revenues up 5 per cent sequentially and up 10 per cent year-over-year. Looking at the parts of Intel's business that didn't do so well, Client Computing Group revenue (which covers the PC processor business) was up 2 per cent sequentially but down 14 per cent year-over-year. Software and Services operations didn't do quite so badly, being flat sequentially and down 3 per cent year-over-year. Accompanying the results Intel CEO Brian Krzanich made a statement saying "Second-quarter results demonstrate the transformation of our business as growth in data center, memory and IoT accounted for more than 70 percent of our operating profit and helped offset a challenging PC market". Krzanich looks forward to his own company's Skylake launch and the release of Windows 10 "We expect the launches of Skylake, Microsoft's Windows 10 and new OEM systems will bring excitement to client computing in the second half of 2015". The markets have looked positively upon the results as Intel shows it can replace slipping PC chip demand with other businesses, without too much pain. In after hours trading shares peaked to gain nearly 10 per cent but things have settled down now, shares are currently up 3 per cent pre-market. Thing should improve as they appear to have stopped the massive tablet/phone subsidy, as it appears to have been one of the greatest wastes of money in history.